There’s nothing quite like having some time off from work, or just a lazy weekend where you have nothing planned (other than a lot of couch time, of course). 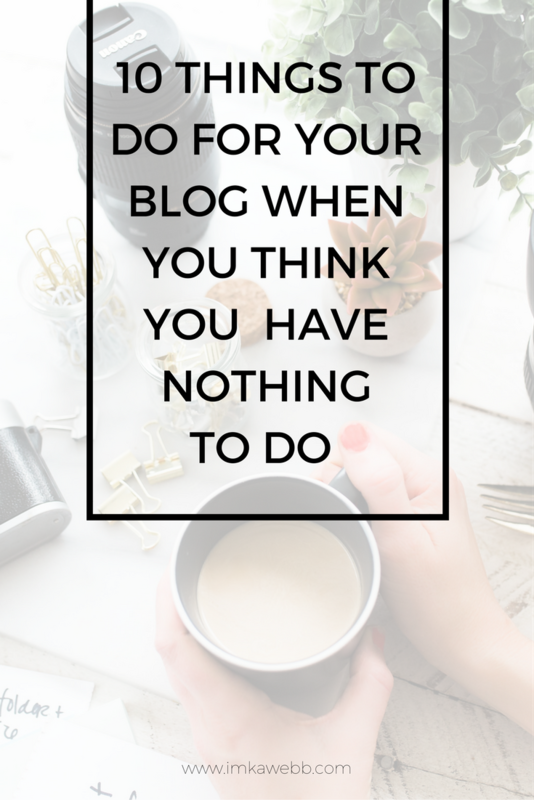 Even though this is something we all enjoy, it can tend to be a bit boring when you have absolutely nothing to do, so I have decided to make a list of 10 things to do for your blog when you have nothing to do. It doesn’t really matter if you are bored or just have absolutely nothing to do, this list contains 10 easy things you can do for your blog (even when you have nothing to blog about). Take a long look at your blog’s sidebar. Is your sidebar cluttered and not working for your blog? What can you remove from your blog’s sidebar? What can you add to your blog’s sidebar? My FREE ebook, Transform Your Blog in 7 Days, contains great advice on how to declutter your blog’s sidebar. You can download it here. I am a serious scheduler and I schedule my blog posts at least two weeks in advance. When I find myself lounging around with nothing to do, I often think about other blog posts I could write. And I use these ideas to fill up my blog’s editorial calendar. Sometimes, I often have my blog content planned 6 – 8 weeks in advance! Because I still have a full time job, I don’t always have the time to be on social media every two to three hours. Therefore, when I have a few minutes to spare, I always schedule my social media posts in advance. To do this, I use Hootsuite. Recently I have really been into doing online courses and learning more about blogging and the blogging industry. Doing online courses, designed by other bloggers, is a great way to learn from their experiences and I also find that I always learn something new that I can apply to my blog to make it even better! Byregina.com has some of the best FREE blogging courses out there and I have learnt so much from her. It doesn’t matter what you are into, you will find an online course to do. Another quick and easy thing you can do is to update your social media and bio. Ensure that your profile pic is consistent across all platforms and that your social media bio tells you exactly what you want readers to know and understand about your blog or small biz. Whilst we’re on the topic of social media, why don’t you look around you and take some images for your social media accounts? Share something pretty, something useful or something behind the scenes with your readers. Why don’t you take some time to comment on other blogs? Take a look at the comments on your own blog, and visit the blogs of your readers. Leave them a thoughtful and loving comment and thank them for their support. If you come across a very helpful blog post, leave a comment, thanking the author for making your life easier. We all have those bloggers that inspire us, right? Why don’t you give them a follow on their social media accounts? Who knows, they might even follow you back! Nothing is quite as motivating as a list of goals and objectives. I prefer writing long-term goals in the front of my notebook, and short term goals at the start of every month. Seeing my goals and objectives keep me motivated and holds me accountable. Try it, it works! Go through all of your older blog posts and change the cover images up a little bit. Now, pin these images to your Pinterest. Even though it comes from the same URL, the different image won’t make it seem like duplicate pins and will still gain traffic to your site. What do you do to improve your blog when you have nothing to do? Let’s chat in the comment section below.